Representatives of The American Ceramic Society (ACerS), the European Ceramic Society (ECerS), the German Ceramic Society (DKG) and the German Materials Society (DGM) joined the International Rhine Ceramic Round Table to discuss, share, and coordinate ideas and initiatives on promoting ceramic science and technology at an international and interdisciplinary level. 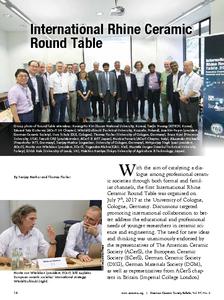 The International Rhine Ceramic Round Table, with globally acclaimed professional voices, initiated an important discussion on the most critical challenges of science and technology of functional materials and ceramics. More importantly, this expert group underlined the role of professional societies in enabling open innovation and global collaboration for augmenting professional recognition and visibility of the field. All panel members and attendees agreed to maintain a more thorough and continuous exchange and supported the agenda “act locally, connect globally” with the aim of increasing the value proposition for members and catering to the pressing needs of diversity and internationalization. This article is originally published in the ACerS Bulletin and we acknowledge the permission of the American Ceramic Society to post the content on our website.